Eagle Optics saw my review of the Denali spotting scope and they were kind enough to let me return it and exchange it for the Vortex Pro GT Tripod Kit of the same value. My father-in-law is allowing me to use his Celestron spotting scope while he breaks in his new ProMaster, so I just needed a good tripod; one that will work well with the high-end spotting scope I am saving up for. 1. This thing is built to be durable. It weighs a little more than my old one, but I packed it around for two hours with no problem. 2. The quick-release plate that you screw to your spotting scope is awesome and fast. I particularly like the spring-loaded locking pin to help make sure I don't release it while hiking over rocks. 3. It has quick-release extension legs which are nice. I typically pack my tripod mounted scope around with the legs fully extended, but having the ability to shorten or lengthen the legs quickly at any given time is nice. 4. This tripod lets me enjoy looking through my scope at a comfortable height. I am just under six feet tall and many tripods don't accommodate me. Always make sure to look for maximum height specifications before purchasing a scope. 5. This scope comes with a nice carryng case, adjustment tools, and an extra quick-release plate. 6. The tripod head movement action is very important for birding, especially when trying to follow birds of prey in flight. I find that the Vortex head moves pretty nicely. Higher end tripods like Manfrotto's may be better, but I am satisfied with this one. You give us very nice detail on tripod kit that its useful to take perfect picture or photo I am very excited about this one.I am professional photographer I want to plan to buy this one it is really very useful.I will use tripod to take Panoramas, and i Motion films.This tripod look so nice.Thanks. 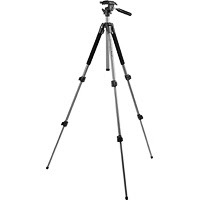 I'm thinking about getting this tripod as an upgrade from the Manfrotto MK394-H Aluminum Tripod With 3-Way Head. Thanks for the review!